I stir. It is only 4am. The sound of the morning alarm seems to echo from some distant place. I am deeply asleep. Quickly I realize it is the morning we leave for the North Pole and it is time for me to get up. As I get out of bed, the woozy feeling that swims through my head and stomach immediately tells me that I have not rested enough. I remind myself that I only got to bed a couple of hours earlier. We had been up most of the night getting last minute preparations together for our North Pole journey, checking rented gear, fixing costume pieces, finishing my new song and packing Arctic-ready luggage. The time has come to get on the road. My feelings are a tapestry of fatigue, fear, anticipation and quiet surrender. I begin to focus on moving quickly to take my mind off feeling less than rested and to make our plane’s early departure. The night before any trip, I like to go to bed only once I have signed off on all the tasks on my to do list. For me, the time between rising and leaving home is not a time to prepare things. Rishi however has a different rhythm. He has planned to download files, burn backing tracks to disk for the songs I am to perform at the North Pole, load the backup materials onto the iPod, iPad and iPhone, then listen through these to make sure they are all in order – all after rising and before walking out our front door. We leave the house 30 minutes later than scheduled and soon find ourselves thick in rush hour traffic, which has already congested the Trans-Canada Highway. Unexpected construction slows us down even further, as the lanes narrow to a single file. We all begin to wonder if we will make our departure flight. The traffic is moving slowly but continuously, so we remain optimistic. We arrive at the airport one hour before our scheduled departure time. We rush to the Air Canada counter, where luckily there was no queue. We immediately begin to check in our luggage. We are told that some of it is overweight. When we hear the rates for excess baggage, Rishi, Sunanda and I pull open our massive bags and dive into repacking them on the spot. We pull out a tent, boots, food…Surely there is a way to reshuffle our belongings so that we pass the weight allowance. With the support of a patient staff member, we succeed. We are asked to hurry to our departure gate, but first we must check two pieces of fragile luggage in a different area. The boom box that is to play the backing tracks at the North Pole performance and the wig, which is part of my costume, need special handling. After moving through the details of security, we grab our belongings and run to our departure gate. Once there, we see people just beginning to board our plane. Rishi and Sunanda leave to go grab a quick coffee. Moments after they are out of sight, our boarding area is soon nearly empty. I am not able to go get Sunanda and Rishi, as I must stay with our carry on bags, the video equipment being the most valuable of these. So I wait for them to return as I watch the waiting area become barren. Soon I hear a voice over the loudspeaker: “Last call for passengers Jordon, Devi and Gerald.” I try to flag down Rishi and Sunanda who I can now see in the distance and signal to the attendant at the desk that we are coming. When we arrive at the gate desk, the woman tells us that we are lucky as they were about to remove our luggage from the plane and leave without us. Rishi hands me his coffee and pulls out the video camera. He gets right into documentarian mode and begins to film me walking onto the plane. He wisely knows that we have only one chance to document this journey. In contrast to our excitement, the general mood in the plane seems glum, perhaps because passengers know that our tardiness has held up the plane or perhaps because it is so early and people feel constrained in their starched shirts and pressed suits and ties. This plane clearly goes to Canada’s capital city, Ottawa. We waddle through the narrow aisle towards our seats dressed like Arctic explorers with layered woollies, snowmobile boots, gloves, hats and thick winter coats. During the flight, I wonder about the majority of people on board who are only traveling from Toronto to Ottawa. I think of the impact of the plane’s fuel on the environment. I wonder why these people did not chose to take the train or drive. I contemplate the benefits of flying and question if they truly outweigh the inconveniences of such for a short flight. Are people hypnotized by an illusion that flying is better? By my calculations, it takes about the same amount of time to fly as it would to drive or taking the train. Why is flying better? Certainly it is not better for the environment. I begin to feel concerned about the carbon footprint of our trip to the North Pole, as we move to help raise awareness of the problems of pollution and the negative effect that has on the melting polar ice caps. We deplane in Ottawa and make it to our next departure gate. This time there is no rush. We enjoy a quiet and easy hour layover, get something to eat, catch our breath, capture a bit more video footage and discuss the day ahead. Boarding a much smaller plane to Iqaluit already signals change. As compared to the fully packed Air Canada early morning flight to Ottawa, this First Air flight is minimally dotted with a variety of passengers: a couple business people, a few people in casual dress and a number of burly, outdoorsy types. Among these were the Inuit, who somehow felt different. I sense in the Inuit something that I feel will reveal itself to me through this trip. I am not sure what it is. I know it feels both familiar and powerful. Several hours into our flight, we move below the clouds so that we can see the Earth. Looking out the window, the landscape below is beautiful. With only an occasional dusting of snow, the land looks barren carved into a reddish-brown rocky shale. I wonder what the surface of the Moon looks like. I feel grateful for the sky, the sun and all the colours before me. I wonder how people live in this land, without trees. I think of the word “tundra”, which for some reason, as a child, I always loved. T-u-n-d-r-a… it sounds special, like the name of a magical land. This moment feels almost surreal, like what I now experience is the realization of a quiet and ancient dream, as though I always knew I would take this journey. Below I see a few dots of colour that seem alien to the land. As we get closer, I realize they are buildings. Dirt and gravel roads weave between scattered blocks that look like painted sugar cubes that have been transported by air and randomly placed on the ground. The architect in me questions the relationship between a building and its environment. These buildings look as far as you can get from a natural emergence from the land. Instead, they look like vague thought patterns casually imposed upon the Earth, an effort to create systems in the mystery of Nature. 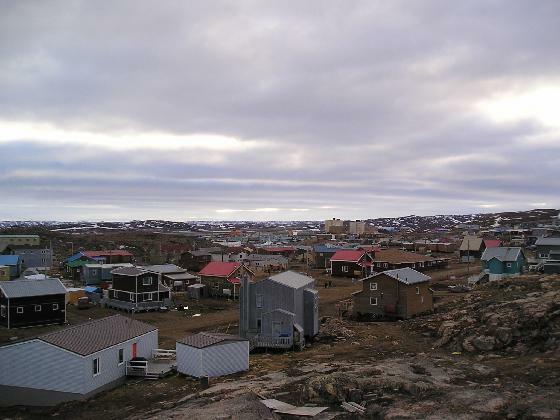 This inhabited area, which I hear announced over the loudspeaker is Iqaluit, looks very remote, isolated, vulnerable and small. I think to myself, if this is Iqaluit, Nunavut Territory’s capital city, what will Resolute Bay look like? In my mind I had thought that Resolute Bay would be the size of what I see now. Where have I arrived? I wonder what surprises lie ahead on our journey. Beautifully described. I love the details of colour, action and sound. 🙂 Looking forward to more. Uhmm, thank God I was not there pushing, I would have been so stressed. There is a purity to your writing, a sort of innocence that is, if not child-like, then at least fairy-like. You share what you see and how you feel about it, without any evidence of an attempt to impress or cajole your audience, and you look at things through fresh eyes. I really enjoy it. Thanks for doing this Parvati and Rishi! Wow… what an exciting journey. I enjoyed the read. Thank you Parvati, for keeping the memory alive. Travelling is stressful, no matter how organized you are, cause there is always the danger of unexpected delays and missing your (connecting) flight. Dealing with the luggage and having only 15 minutes to spare to get through customs and to the gate was enough to have me close to tears by the time we reached our seats. I realized that I am still very attached to having things under control. The barren landscape made me sad and I realized that I could not live without trees and plants and all those green, living organisms that we, in Toronto, take so much for granted. It made me realize how much I love Nature and how right it felt to be on this journey to help heal and protect it. I am sorry for getting coffee last minute and for not having all the gear ready the night before. How quickly I conveniently forget. Funny thing is that was the last coffee I would have in days. No Tim Horton’s after that. Come to think of it I have not had a coffee since then. Wow. I am free!